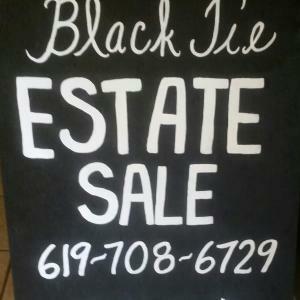 Don't just have an estate sale, have a Black Tie experience. At Black Tie Estate Sales we are a professional, licensed, insured estate liquidation company with a team dedicated to handling all the details of liquidating your personal property. Our goal is to give you piece of mind that you are in trusted, caring hands. We take a great deal of pride in the appearance of our sales as we take the time to organize and stage all of your possessions to give your home a professional look that buyers will want to shop in. Our team is dressed in tuxedo t shirts in order to stand out so buyers know exactly who to ask for help as well as to add a bit of fun to our setup. We are a veteran owned and operated company, always offer a free consultation and look forward to offering you a Black Tie experience. Finally a look inside at Crest Dr. Come see the treasures you have waited for. Very well cared for home, beds, couches, dining sets, tools, fishing items, kitchenware, patio set, t.v.s, gun cabinet, and so much more. Calling all wolf lovers, come see all this home has to offer. Beautiful bedroom set, Brand new Queen size Serta bed, couches, white Clad ice box tables, roll top desk, 3 flat screen TVs, tools and more. part 3 and final sale in this full house. So much more to see. Vintage quality furniture is what you will find here. Bedroom sets, dining set. Rocker, dolls, clothing, tools and tool chests, refrigerators, washer and dryer, and so much more. Come take a look! 3 day sale in Sierra Dawn, so much to choose from. What You Didn't Get For Christmas! Gated community. We will be at the Commonwealth gate to open it for you. Beautiful well kept home with lovely items. Everything is like new. Couch, dining set, mirrors. Chairs, futon, dishes, decor and more. Tools, tools, tools hide a bed x2, records, dvds, cds, vintage cameras, large dining set for Thanksgiving, brass bed, dishes, vintage items, shoes, bike, and much more! Come out and see us. Beautiful well cared for home full of modern goodies. For the antique lover. So many collectables, teapots, crystal, 2 beds, recliners, sofabed, bedroom set, clothes, patio furniture, kitchen items and so much more. Dont miss it!! Vintage Records, Vintage Books, Comics, Models, wall of DVDs, Tools, vintage craftsman, Like new couch, adjustable twin beds, and sooooo much more. Don't miss it! Photos Coming Soon! Beautiful, well kept, Del Webb home with plenty to see. A small but clean home with treasures to see! Beautiful, well cared for home in a gated senior community. We will have an employee outside to let you in. A lovely well kept home with everything you can imagine. Beautiful custom home in Hemet filled with many vintage finds along with other treasures. Do you fish, hunt, like working on cars, enjoy tools, camping, motorcycles or vintage items? Our sale is for you! So many items it cant be done in one weekend! More Photos coming!!! One Day only, Crazy deals, Blowout prices! Come help us empty this house!!! !No reasonable offers refused!Some new items. Unique vintage treasures mixed in with plenty of household goods. Don't miss it! Mickey Mouse collection, Lighthouse collection, and many other things not to miss. Beautiful, well cared for home in Seven Hills. Many items to see. Coming Soon! Pictures available tomorrow. Lots to see and If you love plants don't miss it. Fishing equipment, unique rocking chair, kitchen items, Rubbermaid storage shed, desk, nightstands 10 foot Xmas tree, and so much more.